March 25, 2015 bcalvanocoachingLeave a Comment on Weekly Angel Oracle Card Reading for March 23 through 29. Weekly Angel Oracle Card Reading for March 23 through 29. Carmen, intuitive as a young child, grew up in a family of healers. Her connection with spirit and the angels especially Archangels Michael and Raphael became evident at a young age. Her gifts of claircognizance, clairvoyance and telepathy often contributed to her being called “an old soul”. She is an Angeltherapy Practitioner(R) with advanced training, certified medium, a certified hypnotherapist, past life reader, certified Angel Card Reader, as well as a Usui Master/Teacher. She also facilitates past life regression. Her ability to visualize and sense the energy field has often guided physicians and nurses in the care of their patients. She has been an invited guest on spiritual radio talk shows including Souls Journey Radio and 12Radio. In the past, she has been a psychic adviser for http://www.sjlightworkers.net and http://www.12Angel.com. She has spoken at numerous expos and conferences across the US including Lily Dale Assembly in NY and the keynote speaker at Keene, NH’s Women’s Expo this past May. She is a writer for the angel corner of The MIrror Magazine and was a contributing writer for Archangels 101, The Miracles of Archangel Gabriel, and Archangel Raphael by Doreen Virtue and forwww.Selfgrowth.com. In private practice for over fourteen years, she is the the owner of Angelic Essence Healing in the beautiful southwestern part of New Hampshire. Here she works with clients one on one and facilitates a monthly meditation group as well as teaching workshops. She is presently coordinator of a hospital volunteer reiki program and a hospice singer, singing at the bedside of terminally ill individuals and for other life transitions as well as a singer for a women’s chorus in her community. She is also a Mom to three beautiful sons with whom she loves to spend time with. An outdoor enthusiast, she hikes, snow shoes, kayaks and camps while capturing beautiful wildlife and scenery with her camera. 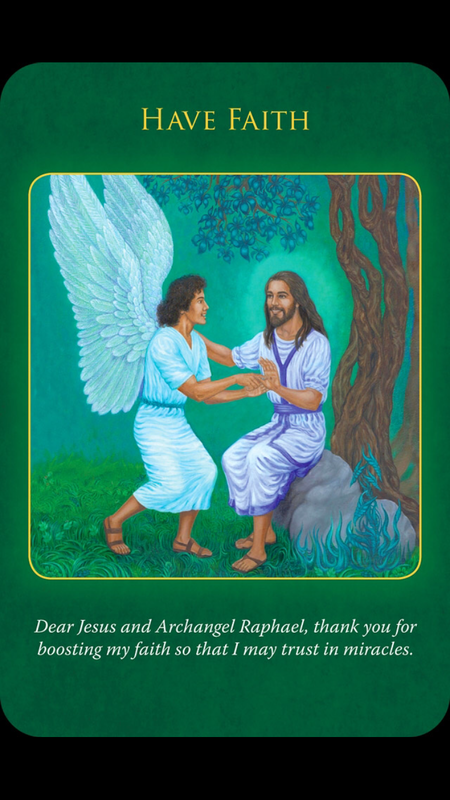 This week I was guided to use the Archangel Raphael Oracle Cards by Doreen Virtue. Miracles are happening everyday though we most often are not present to them. Open your heart to miracles! We are reminded of the true power of faith. If you have been struggling or dealing with issues you can borrow the perfect faith of the ascended master, Jesus. Jesus works with all people regardless of their religion or spiritual background. Know that everything is in perfect order. Worry only worsens your situation. Worry is actually a prayer for manifesting a negative outcome! You may be guided to avoid certain people and only listen to positive friends. Expect miracles! Give all your worries and concerns to God and the angels and then listen and watch for signs as to what actions to take. As it has been said, faith can move mountains. 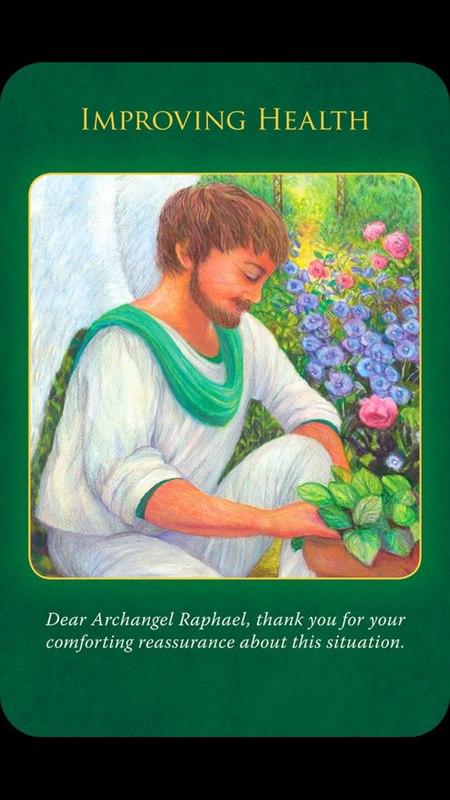 For the middle of the week we have the message,”Improving Health”.’ Dear Archangel Raphael, thank you for your comforting reassurance about this situation.’ Here is a perfect message after the first. Things are improving, perhaps not as fast as we would like but trust that all is happening in divine timing. When we do not to trust ourselves and life, worry can and does affect our health. 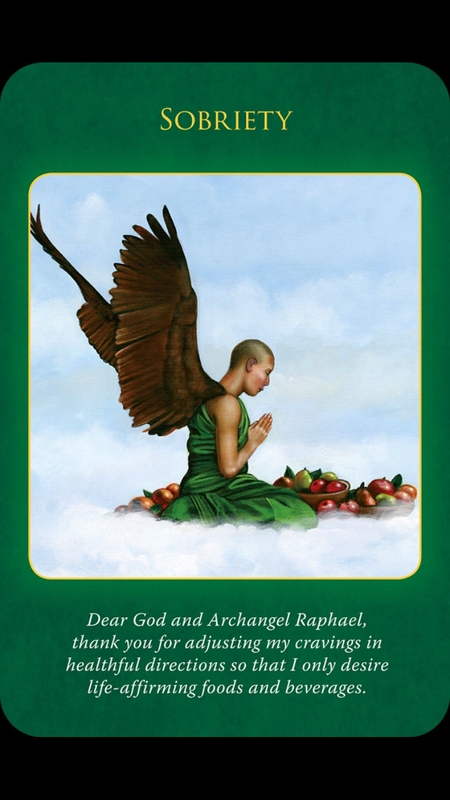 Archangel Raphael is letting us know our situation is improving whether we can see it or not. This message also indicates if you have been receiving messages regarding changes in your diet or lifestyle, trust this guidance. You are being guided in the direction of your dreams and desires. Our fear based ego wants immediate physical results to indicate all is well. The angels are letting us know that things are improving- your health, your finances, your relationships. And for the weekend we have the message, ”Sobriety.” ‘Dear God and Archangel Raphael, thank you for adjusting my cravings in healthful directions so that I only desire life-affirming foods and beverages.’ The clearer your mind and body the easier it will be to follow your inner guidance which is there for you all the time! If you have had repetitive thoughts or signs to detoxify your life, this is clear guidance that it is now time. The answer to many of your issues and unhappy situations in life have to do with addictive behavior. Addictive behavior also shows up as worry, struggle, negativity and pessimism. The angels say to change your life – change your negative patterns. For some it may be to eliminate drugs, alcohol, sugar or caffeine. If you feel blocked or stuck examine if you have any patterns of addictive behavior that no longer serve you. Ask Archangel Raphael to cut your cords of attachment to these foods, beverages and behaviors. This week we have Archangel Raphael, the healing angel to assist us in our lives. We are guided to have perfect faith and give our fears and worries over to God and the angels. Be reassured your prayers have been heard and things are improving – all in divine timing. Sobriety is emphasized, having a mind and body clear of toxic chemicals, foods, and thoughts. This allows a clear spiritual connection – pure and simple. You know what to do, trust yourself! What changes have you been receiving messages to make in your life? Being clear and present is your best action! 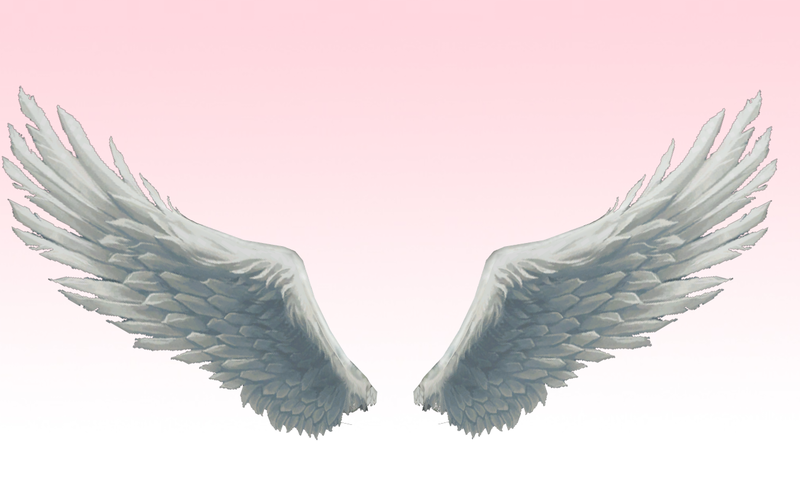 Learn about the Archangels and their specific roles to support your healing and protection. Experience a chakra and sound healing. 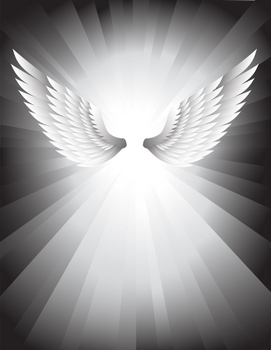 Learn about angel therapy -energy clearing and balancing with the angels. Learn to connect and receive angel messages. Location: 34 West 28th Street 3rd Fl. NYC 10001 Balance Arts Center $66. 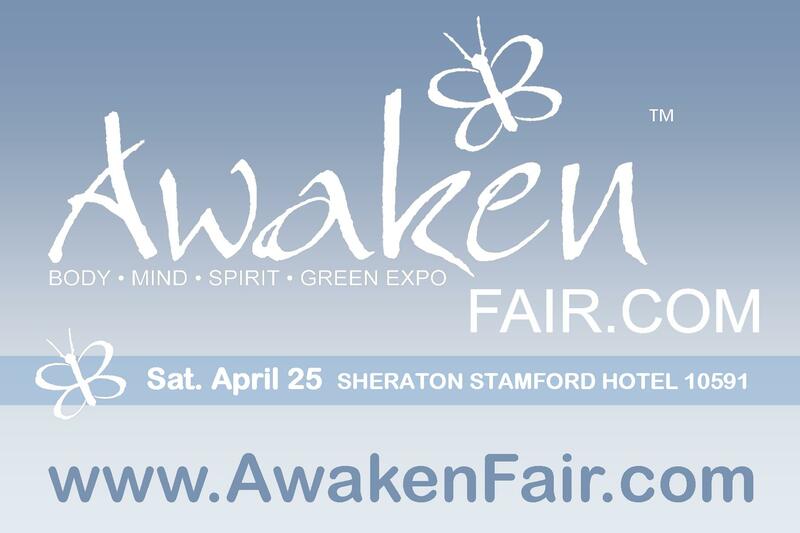 http://www.awakenfair.com 10am-5pm Sheraton Stamford Hotel I will be channeling angel messages & lifecoaching 15 & 30 minute sessions. Next Weekly Angel Oracle Card Reading for March 30 through April 5.